The Haram al Sharif/Temple Mount in Jerusalem. United Nations Secretary-General Ban Ki-moon today welcomed the statement by Prime Minister Benjamin Netanyahu reiterating Israel’s commitment to uphold the status quo at the Haram al Sharif/Temple Mount in Jerusalem. The Secretary-General also said in the statement that strengthened security arrangements between Israel and the Jordanian Waqf would help ensure visitors demonstrate restraint and respect for the sanctity of the holy site. “Only by restoring calm will all parties be able to refocus their efforts on renewing confidence and creating conditions on the ground, in the region and internationally for meaningful negotiations towards a two-state solution and to put an end to the occupation that began in 1967,” he added. He also expressed his appreciation for the discussions which led to the renewed commitment, which were held by United States Secretary of State John Kerry with Prime Minister Netanyahu, Palestinian President Mahmoud Abbas and His Majesty King Abdullah II of Jordan. 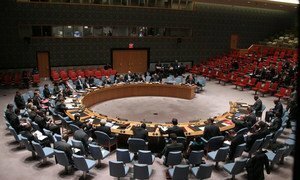 The United Nations Security Council expressed its “grave concern” over escalating tensions around holy sites in Jerusalem and called for the “immediate cessation of violence” and the restoration of calm, especially surrounding the Haram Al-Sharif/Temple Mount compound.